Do you like adventure and do you like to challenge yourself? This journey is unforgettable! 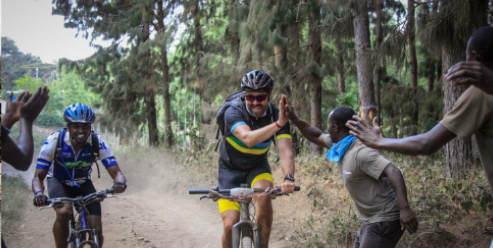 Six days of mountain biking for better health in Africa. Together we can make a difference! The ultimate team building activity for you and your colleagues. Africa Classic creates bonds for life. Contribute to better health in Africa and sign up: Hard work, magic moments! Amref Health Africa, in some countries known as Amref Flying Doctors, is the leading health organisation in Africa. We are an international African organisation founded and headquartered in Kenya. We work on improving the health of vulnerable people, because healthy people have a better chance of being able to provide for themselves and for their families, allowing them to escape from poverty.